Amusing comedy with likeable characters, colourful animation and several great gags, though the script isn't as focussed as it should have been. Jerry Seinfeld voices Barry B. Benson, a young bee who dreams of becoming a pollen jockey rather than a boring hive drone. However, when he ventures outside the hive for the first time, he breaks the primary rule of bee life and speaks to a human – a florist named Vanessa (Renee Zellweger) – after she rescues him. Smitten by Vanessa, Barry begins spending time with her, but on a trip to the supermarket he's horrified to discover that humans are hoarding vast amounts of honey. With the help of a mosquito lawyer named Mooseblood (Chris Rock), Barry sues the humans for the theft of a natural resource, but his victory has devastating consequences. As you'd expect with a script written by Jerry Seinfeld, the joke rate is extremely high, with witty, observational one-liners for the adults and plenty of sight gags for the kids. The animation is colourful and the design of the hive is also extremely imaginative, even if some of the work-related jokes do seem recycled from Antz. Seinfeld is perfectly cast as the neurotic hero and Zellweger gives a delightfully scatty performance as Vanessa. There are also some hilarious cameos by the likes of Ray Liotta and Sting, as well as strong comic support from Matthew Broderick (as Barry's best friend) and from Chris Rock, whose mosquito lawyer gets all the best lines (Hey, I was already a blood-sucking parasite – what else was I going to be?). The script isn't quite focussed enough to really push any emotional buttons with its eco-friendly message, instead preferring to swerve off onto a rather surreal tangent with an action-packed climax involving an aeroplane. 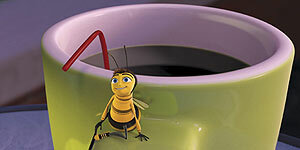 In short, Bee Movie is an entertaining family comedy that will have both kids and adults chuckling throughout. Worth seeing.